When she worked as an orderly at Fletcher Allen Health Care last year, Autumn Polidor was often mistaken for a young boy. The 31-year-old med student has a slight frame and short, brown hair, which was even shorter then. Polidor got tired of explaining herself to people, so, to tip them off, she sewed brightly colored pockets on her scrubs one night. It’s no surprise her sewn creations turned heads, even in the hospital. Before starting med school at the University of Vermont last fall, Polidor made her living creating clothes, handbags and sock monkeys — her best sellers — from recycled materials. She sold them at the Burlington farmers and artists markets under the label Catey is a girl. During a recent interview, Polidor is dressed casually in jeans, but her style sensibility is evident from her creative accessories, most notably a walnut shell fastened to a long chain around her neck. Polidor hadn’t originally planned on a medical career — she majored in studio art as an undergrad at UVM. But last week she was among some 100 members of the UVM College of Medicine’s class of 2014 who received their first doctors’ jackets in the school’s annual White Coat Ceremony. Unlike most of her classmates — who are straight out of college and almost a decade younger — Polidor took a circuitous route to med school. She grew up outside Nashville, Tenn.; her dad worked in the country-music industry, and her mother was a guidance counselor who used to make all Polidor’s dresses. “My parents never really tried to steer me in any direction,” she says. Her twin brother was the one who wanted to be a doctor. He started out premed in college, but changed course and now runs a business with another brother in Tennessee. When Polidor graduated in 2003, she didn’t know what she wanted to do. So she took a job at the Great Harvest Bread Company in Burlington and worked every position. She even mastered the art of baking the Easter Honey Bunny, Polidor says. It was during this time that she began making clothes to sell. Polidor let her found material guide the creative process. She’d collect things from rummage sales and thrift stores: wool suits, sewing patterns, T-shirts. “There’s so much stuff, and none of it is anything anybody wants, in and of itself,” she says. She’d cut up the patterns, laminate them and turn them into wallets. She’d make bags out of the suit coats, removing the labels from the insides and sewing them onto the outside, as if marking her own distinctive brand. For about a year after she left the bakery, she supported herself entirely on the sales from her market stand. It was liberating to be her own boss, Polidor says, but she also felt constricted by the pressure to produce things people would buy. Ultimately, she realized she’d have to hire other people if she wanted the business to remain sustainable. “I wanted to be making stuff, but I didn’t want to be a business owner,” Polidor says. So, she sat down one winter afternoon when business was slow and drew up a list of everything she’d ever been interested in. Her condition improved — it’s now in remission — and in her senior year she took a botany class to fill a science requirement. Though she had always been a good student, Polidor was surprised to find herself acing all the tests. “I was like, How did this happen? Huh. Maybe I’m good at science,” she recalls. If Polidor’s experience with her own health condition doesn’t push her toward specializing in gastrointestinal medicine — at the moment, she’s thinking general practice — it will at least inform the way she treats patients. “[The experience] made me want to have the time and inclination to provide my patients with information so they can educate themselves about their disease,” she declares. Polidor hasn’t sewn anything since she went back to school. Like any first-year med student, she doesn’t have time for much of anything outside the lab and library. But she wants to get back to the sewing machine eventually. 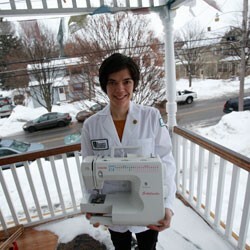 She’s hoping to create a line of hospital gowns for the South End Art Hop’s Strut! fashion show in the future. Plus, she hears her sock-monkey customers are at a loss without her creations.